My left foot went numb when I wear my new running shoes, any suggestions? Just bought a pair of Brooks Adrenaline GTS 14 and they are super comfy. I went to a running store and got fitted and they seemed like a perfect fit, but every time I wear them my toes on my left foot, and only my left foot feels like they go numb. Anybody else have this issue? Or suggestions? I have them and love them…maybe you need to go up in size…to me, they run a little smaller…again, that’s my personal opinion. Good luck. I’m sure others will have great suggestions for you!!! That and make sure your laces aren’t too tight in the toe box… I west glycerine and when I first started one of my feet seemed to go numb. Laces may be too tight. You can Google other ways to tie your shoes too. As MzDee stated you may have to go up a size too. Good luck!! This could be an arch issue. also check and make sure that shoe is the right size. I once bought shoes and one was bigger than the other. Didnt notice til the blisters come. lol. The laces could be too tight also as others are saying. What about your socks? are you wearing thicker socks with this shoe? could be too much in the toebox and cramping your toes up. There is a lot to consider here. I could have written this exact same post. I bought the same shoes last week and had the same problem with my left foot. I’m going to try the loosen the laces before today’s run and see how it goes. I have the same problem with my Asics 2000, my right foot stays numb. I was told not to get the Adrenaline”s based of how they changed the shoe. I’m actually thinking about the New Balance 860’s for a trade in. If this is the case for you both, i am betting you have the laces too tight over the top of the middle of the foot. that bone on the top is very sensitive. I have stopped on long runs before to adjust the laces because it was irritated. We have to remember our feet swell while we are running. nothing wrong with stopping the watch and relacing. I’m going to try loosening my laces and see if that helps. I actually got a size bigger to make sure I had enough room. I have a high arch and need to buy some inserts too. Thanks guys! I just bought my 3rd pair of Adrenalines and am suddenly having this problem too. It’s bizarre. I wonder if they changed them this year. For me it was one of my toes that went numb, not the entire foot. I know with my Asics (GT1000) I needed to use the Power Step inserts to have the right amount of arch support, so maybe I’ll have to do the same with these. I also bought 1/2 size bigger to make up for the swelling. Funny I wore my standard nikes yesterday and had this happen and just started researching new sneakers. Glad it’s not just me! 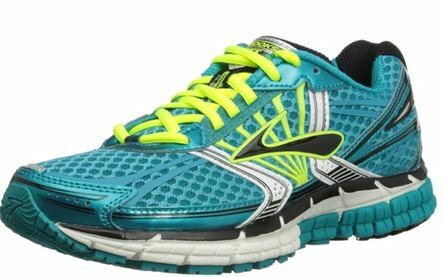 I need a pair that are good for flat feet and I was hoping the Brooks Adrenalines would be the ones! Wasn’t too thrilled with the Asics that I had. I readjusted the lacing for a heel slip and numb foot and nothing is making it better. I love the 30 run and return policy. LOL. I buy a pair specifically for longer runs. Usually a heavier shoe. With lots of stability and cushioning. I go through shoes about every 3 months. So I buy two pairs and rotate them and they last a lil longer. I love adrenalines and used the GTS 13 with no numb issues. I did have these and felt they weren’t as supportive so I put some dr scholls orthotics inside and now no issue! I also used compression socks and mid run thru those things Off and held them the rest of my run. They made my feet literally ache. Loosened up my shoestrings wore different socks and orthotics and that’s the combo I used 🙂 ran my half and my feet were fine. Hoping they feel decent for my full in November. Ok nice to know. I rotate between 3 pair now because I’m really heavy and I don’t want to wear my shoes out too quickly. My first pair of Adrenaline 14s wore unevenly after about a month and a half…fortunately, Brooks replaced them even though the store warranty had expired. After that incident. I bought a few pair to rotate. Thanks for the advice!!! Anyone try Hoka’s conquest? If you want cushion these are the ones, lol They’re a bit pricey, $139.00 but great for cushion. I’ve done 10 miles in them besides shorter runs and love them. Only thing they said was that they’re true to size, nope! I ordered these which are men’s, and the size I ordered was the size I usually get in men’s sized and they were a bit big. I kept them anyways, lol. I’m able to do my thing with them and I don’t experience any discomfort. Got fitted for those at a running store & that was the last time I will let them suggest a shoe to me. They were big n clunky. Also painful to run in. Nope I know my feet better than anyone:) I run in Saucony Triumph’s which I LOVE. I would probably only train with the Hoka. My preference for races are Brooks!! I bought some brooks ghost 6. I had to adjust because I only wore cheap running shoes before that (my guess). I tried going back to my old shoes but that was a mistake. I tried the brooks again now we are best friends. How can you tell someone has run a marathon?